Last night President Donald Trump nominated judge Brett Kavanaugh to the U.S. Supreme Court, to replace the out-going Justice Anthony Kennedy. Kavanaugh was a federal appeals court judge in Washington and by all accounts widely respected in legal circles. As stated at NR, Judge Kavanaugh, 53 years old, has compiled an outstanding record during his twelve years on the federal court of appeals in DC . President Trump praised his nominee as a judge with “impeccable credentials” and said he is “considered a judge’s judge.” Now comes the brutal confirmation process from the LEFT. Democrats, the MSM and the LEFT would not have been happy with any SCOTUS pick from Trump. As it was, they were protesting the SCOTUS pick before they even knew who it was. President Donald Trump on Monday nominated Brett Kavanaugh, a federal appeals court judge in Washington, to succeed Justice Anthony Kennedy on the Supreme Court. Trump made the announcement shortly after 9 p.m. ET at the White House, where he was joined by Kavanaugh and his family. NBC News broke the story shortly before the president made his choice public. “It is my my honor to announce that I will nominate that I will nominate Justice Brett Kavanaugh to the United States Supreme Court,” Trump added. Kavanaugh then emerged, along with his wife, Ashley, and two young daughters. Judge Kavanaugh has been selected to fill the seat of retiring Justice Anthony Kennedy, for whom he clerked — along with Neil Gorsuch — 25 years ago. A graduate of Yale College and Yale Law School, Kavanaugh has dedicated his career to public service. He worked for several years in the Office of Independent Counsel under Ken Starr and then for five years in the White House of President George W. Bush, first in the White House counsel’s office and then in the role of staff secretary. During an interlude in private practice, he headed the Federalist Society’s Religious Liberties Practice Group and wrote two pro bono Supreme Court amicus briefs in support of the cause of religious liberty. Kavanaugh is a lector at his Catholic parish, where he also coaches his daughters’ CYO basketball teams. He also volunteers with Catholic charities and teaches and mentors in local schools. He is as fit off the court as he is on it: The former captain of his high-school basketball team runs regularly and has won his court’s annual 5-K five times. Now that President Trump has nominated a second justice to the Supreme Court, the LEFT will be whipped up into a lather even more than before. No justice that Trump would have nominated is okay to the LEFT because it was not Hillary Clinton who did so. As a shudder to even contemplate such an act. But as Barack Obama reminded Republicans when he was elected, “elections have consequences.” . As reported at Reuters, U.S. District Judge T.S. Ellis III questioned in federal court in Virginia that the Special Counsel Robert Mueller should not have “unfettered power.” in the Russia probe. Judge T.S. Ellis went on the rebuke the Mueller investigation with regards to the Paul Manifort case in that they exceeded their authority. Judge Ellis went on to say, “You don’t really care about Mr. Manafort. You really care about what information Mr. Manafort can give you to lead to Mr. Trump” and his eventual prosecution or impeachment.” It is about time some one put their foot down with regards to the out of control Mueller witch hunt. The federal judge literally accused the Muller team of lying. Even CNN fake news had to admit this was a bad day for the Mueller team. A federal judge said Special Counsel Robert Mueller should not have “unfettered power” in probing ties between President Donald Trump’s campaign and Russia, and accused Mueller of using criminal cases to pressure Trump’s allies to turn against him. Judge Ellis doesn’t find [an authority to investigate such matters] in the May 2017 memo by Deputy Attorney General Rosenstein. Team Mueller was represented at the hearing by former deputy solicitor general Michael Dreeben. At the hearing Dreeben took a drubbing. Asserting that Mueller’s authority is even broader than the mandate given 2017 memo, Dreeben claimed that national security precluded a full accounting of Mueller’s authority. Dreeben cited Rosenstein’s August 2017 memo — covered by Andrew McCarthy in this NR column — explicitly granting Mueller the authority to investigate Manafort’s Ukraine dealings years before the 2016 election. Mueller must have given Judge Ellis the same highly redacted copy of the August 2017 memo that is linked above. Judge Ellis wanted to see the whole thing. He gave Mueller two weeks to consult with intelligence agencies to determine whether they can confide a sealed, unredacted version of the memo with him. Dreeben told him the redacted portions did not pertain to the Manafort case. “I’ll be the judge,” Ellis said. Yesterday, a four-member Nevada Board of Parole Commissioners voted unanimously to parole O.J. Simpson. He could be free as soon as October 1, 2017. OJ Simpson, one of the most polarizing individuals of our time will be let out of prison after serving 9 of 33 years for his involvement in the 2007 robbery at a Las Vegas hotel room. However, where it is right or wrong, pertains to his incarcerated crimes or not, people view Simpson for the heinous crime he got away with in the 1994 double murders of his ex-wife, Nicole Brown Simpson and Ron Goldman. That’s just a fact. For all those yesterday in the news and on sports talk shows who stated we should get over it and that this is was justice, spare us the dribble, you were most likely in diapers when Nicole Brown Simpson nearly had her head cut off. 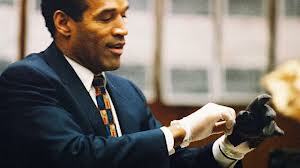 People will always be livid when it comes to O.J. Simpson, because they know that JUSTICE WAS NOT SERVED. O.J. Simpson, the polarizing former football star, seemed to suggest he was ready to recede from the spotlight after succeeding in his quest for freedom after being incarcerated for nine years at a desert prison in northern Nevada. Simpson, convicted of robbery and kidnapping, was granted parole Thursday — a unanimous vote by the four-member Nevada Board of Parole Commissioners reported instantly by national and international media. He could be free as soon as Oct. 1. Sorry, OJ will always be a pariah and by witness from his past acts, this narcissist will hardly stay out of the spotlight. Maybe now that Simpson is free, he can go back to looking for his former wife’s killer like he had promised to do. Judicial Watch has filed a lawsuit against the Department of Justice for the records on Loretta Lynch and Bill Clinton’s meeting on the tarmac at Phoenix Sky Harbor International Airport prior to the 2016 presidential election and during the time in which then candidate Hillary Clinton’s email server was supposedly being investigated by the FBI. The FOIA request asks for all records related to the meeting held between then-Attorney General Loretta Lynch and former President Bill Clinton at Phoenix Sky Harbor International Airport in 2016. The government watchdog group Judicial Watch has filed a Freedom of Information Act (FOIA) lawsuit against the Department of Justice (DOJ) seeking all records its has on the June 27, 2016 meeting between President Bill Clinton and then-Attorney General Loretta Lynch in her airplane, a meeting that occurred while the FBI was investigating Hillary Clinton’s use of a private email server, a potential national security crime. Yeah, no conflicts of interest here or gross appearance of impropriety here, move on. Judicial Watch announced today that it filed a Freedom of Information Act (FOIA) lawsuit against the Department of Justice for records related to the meeting held between then-Attorney General Loretta Lynch and former President Bill Clinton at Phoenix Sky Harbor International Airport in 2016 (Judicial Watch v. U.S. Department of Justice (No. 1:17-cv-00421)). All records and/or transcripts of a meeting held between Attorney General Loretta Lynch and former President Bill Clinton in June 2016. All records of communication sent to or from officials in the Office of the Attorney General regarding the meeting held between Attorney General Loretta Lynch and former President Bill Clinton in June 2016. All records of communication sent to or from officials in the Office of the Deputy Attorney General regarding the meeting held between Attorney General Loretta Lynch and former President Bill Clinton in June 2016. All references to the meeting held between Attorney General Loretta Lynch and former President Bill Clinton contained in day planners, calendars and schedules in the Office of the Attorney General. Lynch met privately with former President Bill Clinton on board a parked plane. The meeting occurred during the then-ongoing investigation of Mrs. Clinton’s email server, and only a few days before she was interview by the FBI. Lynch later admitted that the meeting with Bill Clinton “cast a cloud” over the Justice Department/FBI investigation. Not long afterward, FBI Director James Comey called Hillary Clinton’s actions “extremely careless” but did not recommend charges. Judicial Watch requested the Justice Inspector General investigate the tarmac meeting. ONE HAS TO QUESTION HOW AN INDIVIDUAL THAT IS SO POLITICALLY BIAS CAN ACTUALLY SIT ON THE HIGHEST COURT IN THE LAND … SO MUCH FOR JUSTICE BEING BLIND. Last night Justice Ruth Bader Ginsburg was a no show for President Donald Trump’s first Address to Congress and it was expected. The 83 year old aging justice, appointed by Bill Clinton in 1993 had no issue attending his joint speeches to Congress, nor Barack Obama’s. However, she was a no show for any of President George W. Bush’s speeches and was AWOL last night as well for President Trump’s first Address to Congress. t is one thing for a justice of the SCOTUS to not attend any of the presidential joint speeches to Congress or the State of the Union events, but for a justice to only attend for Democrat presidents and not of the GOP makes one scratch their head as to how their judicial judgements could be considered not politically bias. It is troubling for a justice of the SCOTUS to only skip the joint speeches of a particular party, no matter which party it is. 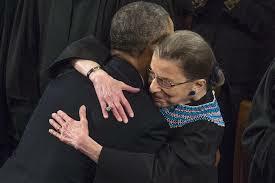 U.S. Supreme Court Justice Ruth Bader Ginsburg always hugged President Barack Obama before his speeches to Congress. She doesn’t even plan to attend President Donald Trump’s first one. Ginsburg, who called Trump a “faker” during his campaign, intends to skip Tuesday night’s speech, leaving it to five of her colleagues to represent the court. Chief Justice John Roberts will join Justices Anthony Kennedy, Stephen Breyer, Sonia Sotomayor and Elena Kagan in attendance, court spokeswoman Kathy Arberg confirmed. All are regulars at the annual event. Justices Clarence Thomas and Samuel Alito aren’t planning to attend, continuing their past practice. Alito hasn’t gone to a speech since 2010, the year Obama criticized the justices’ just-issued Citizens United campaign-finance ruling. Obama accused the court of ignoring a century of precedent, a claim that prompted Alito to shake his head and mouth “not true” as Democratic lawmakers directly behind the justices rose to cheer. Ginsburg, a 1993 appointee of Democrat Bill Clinton, also skipped Republican President George W. Bush’s speeches. She attended all eight of Obama’s. However, the poetic justice to this partisan justice will be when President Donald J. Trump nominates her successor.